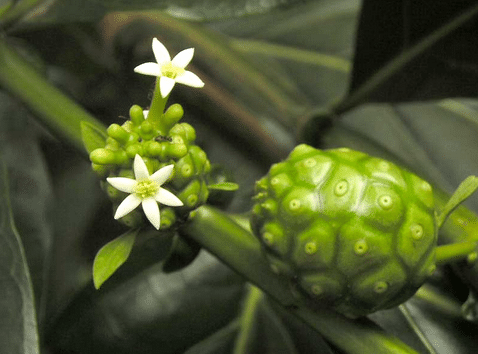 Morinda citrifolia is known in Hawaii, Puerto Rico, and in Polynesia as “noni” or “Indian mulberry”. It is a shrub with a height of 10 m with small white flowers that bloom throughout the year. Morinda leaves are shiny, dark green, in the shape of a star. The plant is used not only in medicine but also in the production of natural paint. For therapeutic use all parts of the plant. Traditionally used in the treatment of cancers, respiratory diseases, urinary tract and in the treatment of diseases of the blood, alleviation of premenstrual pain, for the treatment of skin disorders of the digestive system, ascariasis (intestinal parasites, gastrointestinal tract, et al.). Leaves and roots have antipyretic and anti-inflammatory properties. Animal studies have shown that the root extract of Morinda citrifolia acts analgetic. Fruits and leaves work antibacterial and ripe fruit great influence on the regimes pathogens – Salmonella and Shigella. The roots and leaves are used in hemorrhoids, venous hold-ups. The roots and leaves regulate the menstrual cycle. Therefore do not be used in pregnant women, because it can cause miscarriage. In addition, Morinda citrifolia has proven itself in the treatment of some cancers. Morinda officinalis. It is generally used in Chinese medicine. Unlike Morinda citrifolia as an active part of the root is used. In Chinese medicine Morinda officinalis are used in the treatment of cancer, sexual dysfunction in males and females, rheumatism, renal and urinary tract. In addition, it is recommended that the disease beriberi, multi-joint inflammation, as a means enhancing fitness. Described is the effect of the root of Morinda officinalis increase of leukocytes and stimulate the endocrine system. The best results in the treatment of rheumatism., Kidney disease, multi-joint inflammation. Morinda officinalis calming effect and is known to be sedated. Chinese clinical studies demonstrate the high efficiency of this plant for the treatment of acute and chronic kidney disease, it has anti-inflammation of the multi-joint. Studies in mice have demonstrated an effect of the aqueous extract of the root of the number of leukocytes in the blood, the condition of the microcirculation of blood. Even in mice suffering from an artificially induced leukopenia white blood cell count returns to normal. Morinda long been used to facilitate digestion and absorption of food in the treatment of respiratory disorders is influenced by the condition of the immune system. Morinda also positively affects the nervous system, stimulates the activity of the endocrine system, relieves pain of arthritis, improves skin condition and its regeneration. They nourish the cells and influence the metabolism of primary cells. Noteworthy action NONI as an analgesic and immune system enhancer. Analgesic properties of the juice are so strong that it can be successfully used in pain accompanying serious diseases such as rheumatic diseases and even cancer. It is no wonder that so rich composition NONI may show multidirectional. Kahuna believe that the juice runs at the level of not only physical, but emotional and this action is the basis of healing. removes outdated liabilities that come from past lives. Remember that if you buy noni juice, see if he was not pasteurized or processed in another way. We require heating destroys enzymes and other nutrients beneficial to health.